The SGI -PVSA pro­cess for up­gra­ding of raw bi­o­gas to bio na­tu­ral gas qua­li­ty applies to a vac­uum re­gen­er­ated pres­sure swing ad­sorp­tion (PVSA) pro­cess. In the raw bi­o­gas exis­ting hig­her hy­dro­car­bons CxHy and H2S sulphur con­tents as well as other im­pu­ri­ties will be pre re­mo­ved on an activated car­bon ­bed be­fo­re the gas en­ters to the down­stream PVSA proc­ess. In the down­stream PVSA proc­ess mainly CO2 other un­de­si­red com­po­nents like ex­ist­ing re­main­ing wa­ter vapour would be si­mul­ta­ne­ously re­moved on spe­cial ad­sorp­tion agents and on a car­bon mo­lecu­lar sieves bed. SGI va­cu­um pump-sets are sin­gle and multi stage units with a com­bi­na­ti­on of sev­eral different sizes and types of ro­tary lobe blower stages. 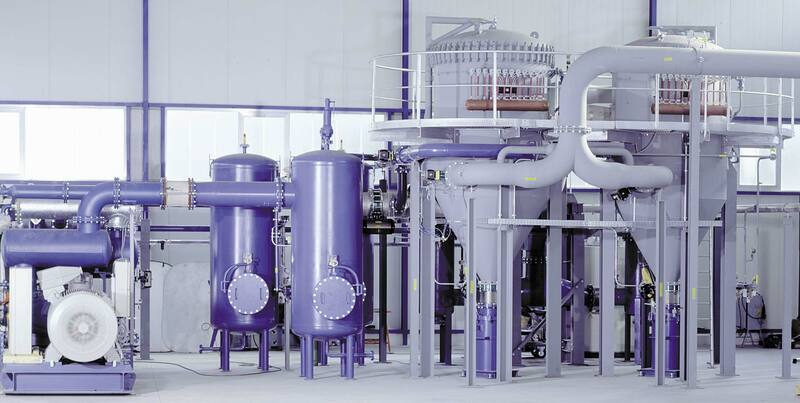 SGI sin­gle stage ro­tary lobe blow­ers with very high suc­tion ca­pac­ity are used for vacuum regeneration of PVSA ad­sorp­tion plants for oxygen gen­era­tion. 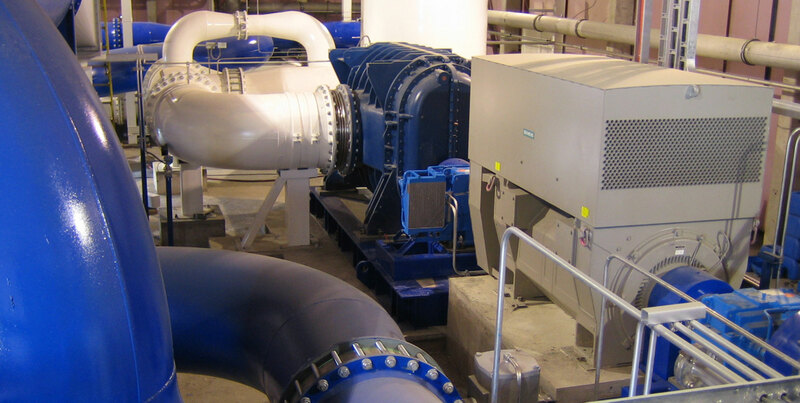 SGI multistage vacuum pump sets are used for other PVSA ad­sorp­tion plants for gas pu­ri­fi­ca­tion and many other ap­pli­ca­tions in in­dus­try and re­search. 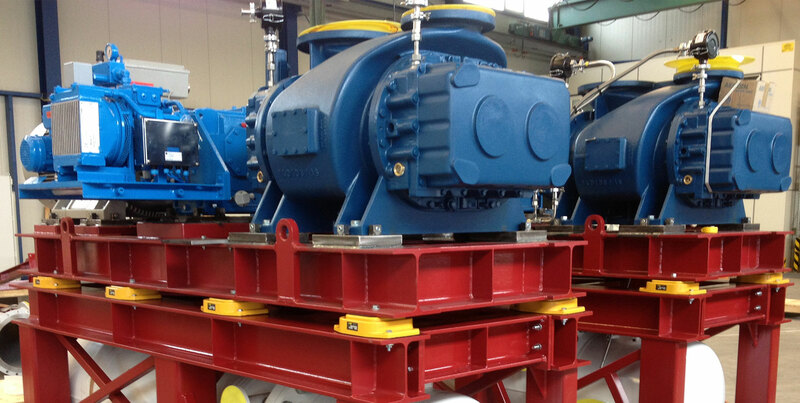 Typi­cal SGI multi stage mechanical vacuum pump set ap­pli­ca­tion is the steel in­dus­try for VD/VOD/RH steel de­gassing using three to four stages with very high suc­tion ca­pac­ity in the mid­dle and fi­nal vacuum. 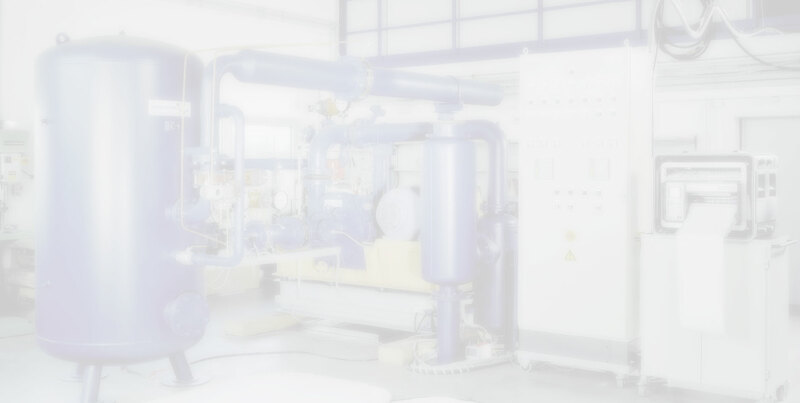 VD/VOD/RH Steel degassing process requires short pump down time to final vacuum ≤ 1 mbara as well as high suction flow for VOD und RH blowing process in the rough vacuum range ≥ 200 down to > 10 mbara. Therefore SGI is using gas pre- inlet cooled rotary lobe blower in combination with a screw vacuum machine, to be able to work up to ≥ 200 mbara pressure controlled as one unit to at­mos­phere. Operation from ≤ 200 mbara down to > 10 mbara pressure controlled in series, gas pre inlet cooled stage- screw machine to atmosphere. Operation ≤ 10 mbara down to ≤ 1 mbara in series, high vacuum rotary lobe stages- gas pre inlet cooled stage- screw machine to atmosphere. 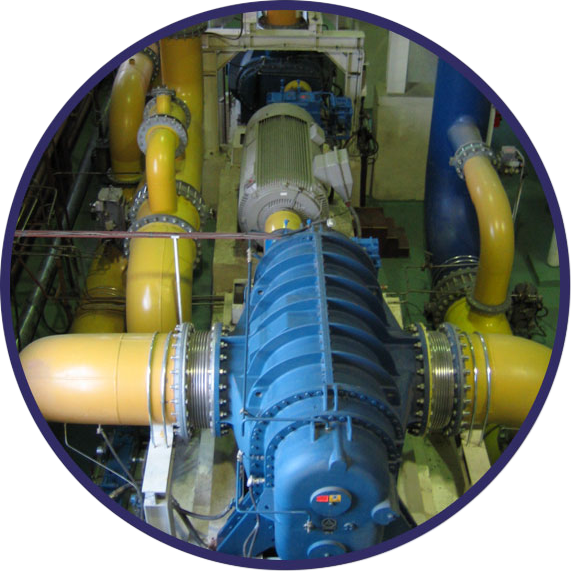 All SGI vacuum pump sets can be executed in accordance to ATEX for cone 1 and 2. Please see SGI publication „Efficient multi- stage vacuum pump sets for steel degassing“ as well as execution VOD process vacuum pump set to ATEX cone 1. The SGI sin­gle sta­ge rot­a­ry lobe com­pres­si­on sys­tem for low pres­su­re up to 2 bara is used in O2 PVSA gas ge­ne­ra­ti­on sys­tems as feed air blo­wers or up to 2 bara as oxy­gen boos­ter blo­wer or as rotary lobe hoo­ked type blower for pres­su­re up to 3 bara. 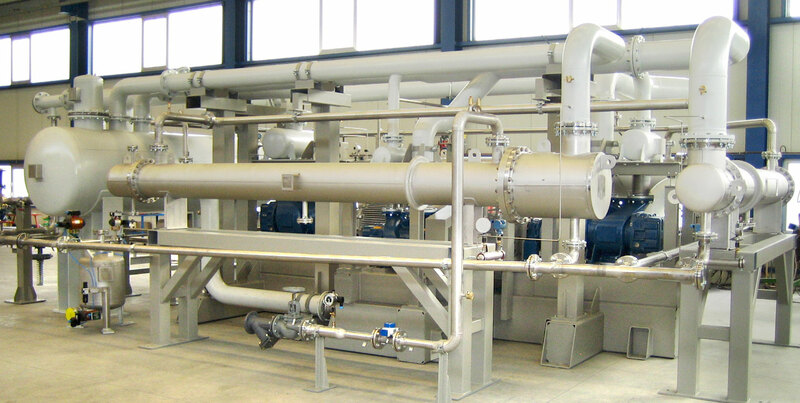 The SGI sin­gle and two stage blower com­pres­si­on sys­tems will be used in other PVSA ad­sorp­tion plants for process gas pu­ri­fi­ca­tion and as process gas pre com­pres­sion blower or as booster. SGI com­pres­sion sys­tems for higher pres­sure up to 40 bara is used in SGI gas re­cy­cling sys­tems for Ar­gon, Ni­tro­gen gas recycling and pu­ri­fi­ca­tion. This higher pres­sure com­pres­sion sys­tems is us­ing up to 7 bara a two stage screw com­pres­sion type and from 7 bara up to 40 bara a 3 stage re­cip­ro­cat­ing com­pres­sor.